The UN Multidimensional Integrated Stabilisation Mission in Mali (MINUSMA) is facing a growing shortage of helicopters after the Indonesian Army Aviation withdrew its three Mi-17V-5s that were deployed in Timbuktu for 12 months. An officer with the Indonesian Medium Utility Helicopter Unit (INDO MUHU) that was contributed to MINUSMA told IHS Jane’s that the helicopters were flown to Bamako on 21 October and disassembled so that they could be loaded on a chartered Antonov An-124-100 transport aircraft, which left for Indonesia on 26 October. 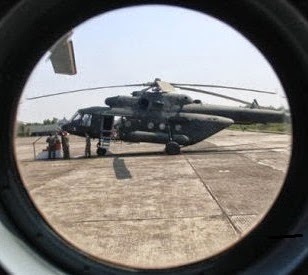 Lieutenant Colonel Zulfimar Caniago, the commanding officer of INDO MUHU, told IHS Jane’s in August that Indonesia would withdraw the unit without replacing it as the Mi-17V5s are needed back in Indonesia for domestic operations. MINUSMA now has no military transport units in Timbuktu and will soon lose both the military helicopter transport and reconnaissance units it currently has in Gao as the Netherlands has confirmed that it needs to withdraw its CH-47D Chinooks and AH-64D Apaches in early 2017. The UN is looking for countries willing to deploy helicopters to Mali and it is understood that talks are ongoing with Germany, which has already agreed to contribute up to 650 military personnel to MINUSMA. Colombian Army Aviation sources confirmed to IHS Jane’s in late September that their service has also been asked to contribute aircraft.